Nelson Mandela is a black leader of international fame to become the first president of South Africa in 1994 and to fight against racial discrimination, serving until 1999. He is famous for his long fight against pro-apartheid government. 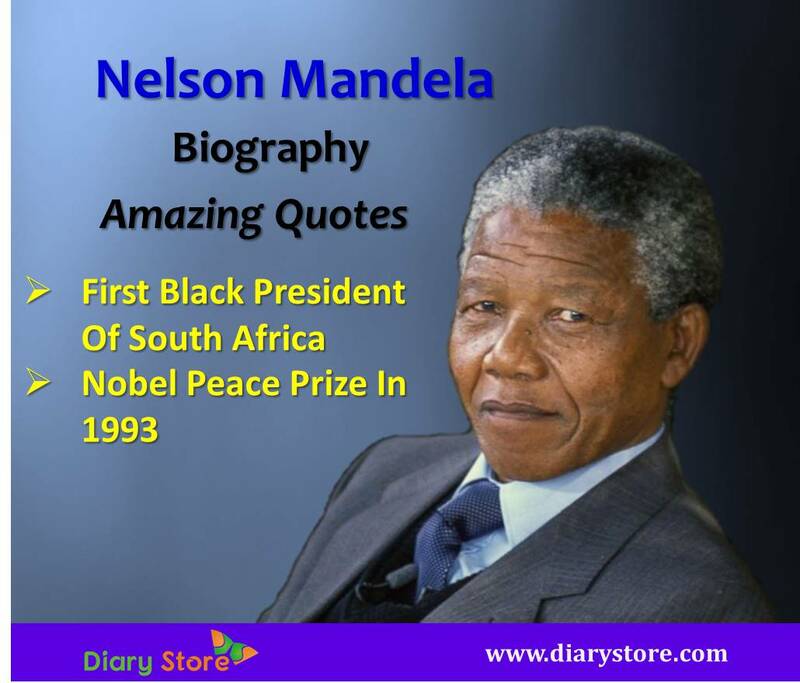 Nelson Mandela stands as a symbol of global peacemaking and he won Nobel peace prize in 1993. He is known by the title ‘the father of the nation’ in South Africa. Rolihlahla Mandela was born on 18 July 1918 in the village of Mvezo in Umtata, South Africa. Rolihlahla meant trouble maker. Mandela’s father Gadla Henry Mphakanyiswa Mandela was a local chef and adviser to the monarch. Gadla was a polygamist with four wives, four sons and nine daughters; Mandela was the youngest of four boys. His mother Nosekeni Fanny was Gadla's third wife. Both his father and mother were illiterate but they were devout Christians. He grew up with his two sisters and mother in the village of Qunu. At the age of seven his mother sent him to a local Methodist school. He was the first member in his family to be sent to school. The prefix ‘Nelson’ was given by his teacher in accordance with the tradition existing there. In 1930, when he was 12 his father died. After his father’s death his mother took him to the "Great Place" palace at Mqhekezweni, where he was entrusted to the regent of thembu, Jongintaba Dalindyebo. Nelson Mandela attended a Methodist mission school, where he studied English, Xhosa, history and geography. 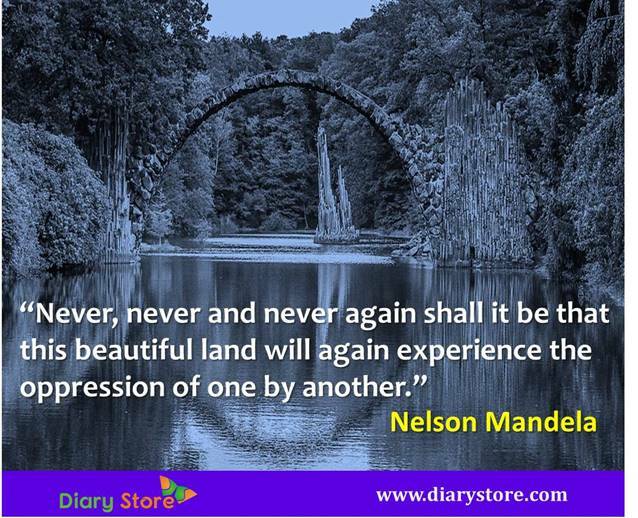 Nelson Mandela learnt about his culture and heritage by the stories narrated by the elder chiefs who came to the Great Palace on official business. It was during this period, he developed a strong love for African history and also he learnt the art of leadership. In 1933 Nelson Mandela attended Clarkebury Methodist High School in Engcobo for secondary education. Nelson Mandela completed his Junior Certificate in two years. After completing the college he went to study BA at Fort Hare University. In 1940 when he was in second year he was expelled from Fort Hare University College for refusing to join the students’ council because of a dispute over the canteen food. After the suspension he went to his village Mqhekezweni in disgrace. He found that his guardian Jongintaba had arranged marriages for Nelson Mandela and Jongintaba’s son. They fled to Johannesburg because they were dismayed by marriage arrangements. After a dramatic journey, Nelson Mandela found work as a night watchman at Crown Mines. After some days he was fired because his headman discovered that he was a runaway. Nelson Mandela stayed with a cousin in George Goch Township, who introduced Nelson Mandela to realtor and ANC activist Walter Sisulu. Later Mandela got a job as an articled clerk. He began attending ANC meetings in 1941. To continue his education Mandela joined BA via correspondence course and studied during the night at University of South Africa. After completing the BA in 1943, he began studying law at the University of the Witwatersrand where he was the only black African student and faced racism in his class. In 1944 Mandela joined the African National Congress (ANC), a South African political party under the leadership of Walter Sisulu, who was increasingly influencing Mandela. ANC's main goal was to fight against the racism and improve the conditions and the rights for black people in South Africa. In the same year he became one of the ANC's younger members of the newly founded ANC's Youth League. He made his mark by helping to manage the newly founded Youth League. In 1950 he became the president of the league. From then on, Mandela continued his fight against the racism more seriously. Impressed by the philosophy of non-violence propounded by Mahatma Gandhi, Mandela began his protest against apartheid with a small group of 10,000 people with Indian and communist members which eventually rose to 100,000 followers in no time. For his anti-apartheid movement, Mandela was arrested a couple of times. First he was arrested in 1952 under the Suppression of Communism Act and stood trial as one of the 21 accused. By this time he was given a six-month ban from attending meeting or talking to more than one individual at a time. Later in 1956, Mandela and other ANC leaders were arrested on charges of high treason. He went on trial with 155 other political leaders. The trial dragged on for nearly five years. Mandela often stayed in prison at night and worked in the day at his law firm. Finally the charges against him and others were disproved in 1961. By this time, however, the South African government had outlawed the ANC. In 1962 Mandela was again arrested, this time for leaving South Africa illegally and for inciting strikes. After 27 years in prison, on February 11, 1990, the state president F.W. de Klerk lifted the ban on the ANC and announced the release of Nelson Mandela from the prison. He received joyful welcomes wherever he went around the world. In 1991, he was elected for the presidency of the ANC. Mandela was elected the first black president of South Africa by winning elections and his election was as expected by the entire world. The original black native people were adamant to rule their own nation and did not allow the native whites to take up ruling position. As a result, several events of social unrest, civil disturbances, turmoil erupted nationwide. However, by the proactive intervention by Mandela, the transfer of power took place peacefully and he became the first pioneer to lead an independent South Africa in 1994. In spite of insistence by his admirers and staunch followers, Mandela did not want to continue as a president for the second term. However, after stepping down from the presidential position, he continued his activities of social service like raising funds for school buildings and health care centers in the rural parts of South Africa. After becoming the founder of the Mandela foundation, he played an active role to mediate in the Burundi civil war. Nelson Mandela married three times. On October 1944 he married Evelyn Ntoko Mase. After 13 years in 1957, they both divorced. The couple had four children; two sons and two daughters, out of whom only two survive presently. Later in 1958, Mandela wed Winnie Madikizela. They couple was blessed with two daughters. The two separated in 1992 and divorced in 1996. On account of his 80th birthday Mandela remarried Graca Machel, widow of Samora Machel. Mandela suffered from deteriorating health condition. Mandela was hospitalized many times due to a series of worsening respiratory problems. Finally Nelson Mandela died on 5 December 2013, aged 95.